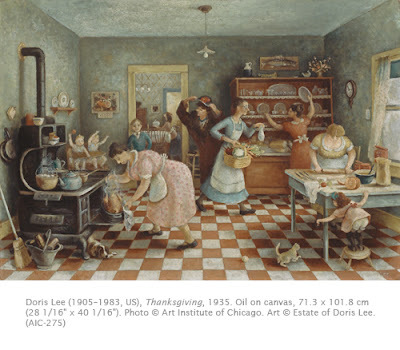 Inspiring Art Teachers to Explore Art History | Curator’s Corner: Happy Thanksgiving…the name says it all! I’m sooo over politics this week, and I want to focus on good ol’ Americana. Thanksgiving is an awesome holiday because it makes people think “THANK YOU for what I have.” I truly believe that many of us (I’m the worst in this respect) take for granted what a great society we live in. Many countries celebrate the idea of giving thanks, mostly in harvest festivals. But if you want to see warm, evocative scenes of American life, look to American primitive artists such as Doris Lee. I swear I can smell the pumpkin pie baking in this painting! Of course Doris Lee was born and raised in rural Illinois, as I was, so I find it very easy to pay attention to her art! Lee was a very active artist during the Depression years (1929–1940), producing paintings, murals, costume designs for theaters, and designs for ceramics and textiles. She studied art at the Kansas City Art Institute in Missouri, as well as in Paris and San Francisco. Interestingly, she was a student of American impressionist Ernest Lawson (1873–1939). Although she did not adopt the impressionist aesthetic, she certainly shared Lawson’s interest in American life and scenery. During the 1930s she was very active in WPA mural projects, which had a decidedly nationalistic bent to subject matter during the morose years of the Depression. I’m interested to see if such an emphasis on realistic subject matter about everyday American life evolves out of our current Great Recession. It is always fascinating to me when artists who work in a realist mode eventually end up doing abstract work. Her late work reminds me very much of American artist Adolf Dehn (1895–1968). In the 1960s she became interested in experimented with shapes, but never entirely abandoned the object. I think some of her late works are awesome in her sense of color, and quite different from works such as Thanksgiving. Studio activity: A collage about a family or group celebration. Select a family or group celebration/holiday and create a collage. Use watercolor or markers to create the background of the scene, and then choose images of different people from magazines to populate the interior/exterior depicted. Explore gender, race, pose and action to make the collage interesting.